Gillian Walnes Perry was awarded an MBE for her work in education. She has spent time with many people who knew Anne Frank personally, and educators from all over the world who have tirelessly been perpetuating the powerful messages of Anne’s life and writing. After 26 years of building the Anne Frank Trust, she retired as the charity’s Executive Director in 2016. 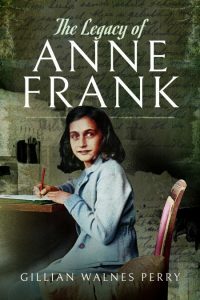 She now lectures and writes about the life and legacy of Anne Frank, as well as a range of popular social history topics. Refreshments follow the reading. The book will be for sale with a portion of the proceeds going to the library thanks to Spotty Dog Books & Ale. The author will be available to sign copies.. It will take place in the community room, which is wheelchair accessible. This entry was posted in Adults, News, Programs, Young Adults and tagged Anne Frank, author reading, Gillian Walnes Perry, holiday shopping by Brenda Shufelt. Bookmark the permalink.